An uncommon program for uncommon results. When students come to us at the Springbrook Autism Program, we understand that it’s usually not their first placement. Many of our students have been through several programs with little to no success before they see us. We also understand that no parent wants to send their child away to a residential treatment program, and our parents are no different—it’s difficult to feel that you’ve done the right thing for your child when you’ve given up daily contact. We know that we’re a last resort for children who are in critical need of behavioral intervention. Through our comprehensive, holistic treatments and therapies, we are able to achieve remarkable results for our students, and for their families. We treat the whole child, and we do it with compassion and care. Perhaps this is why so many of our parents tell us that choosing Springbrook was the best decision they ever made for their child—and why we have such a high client satisfaction score. 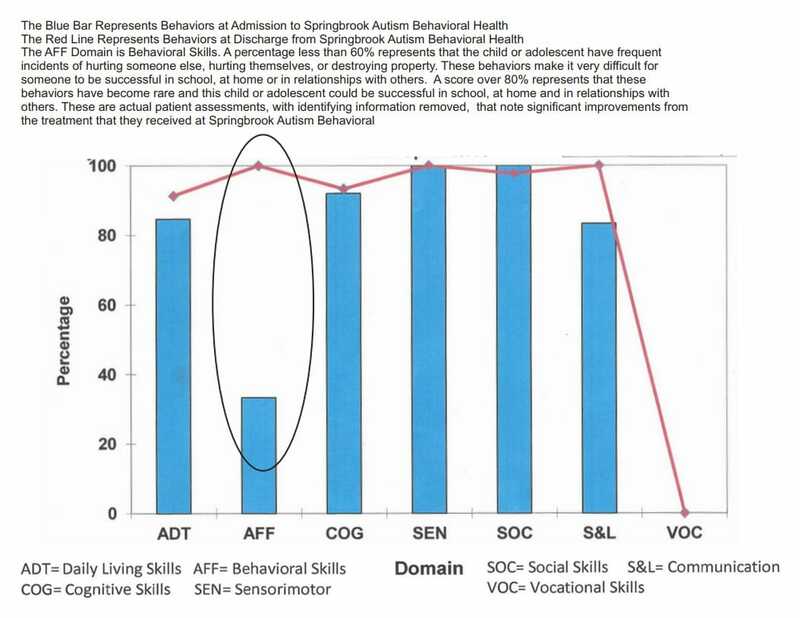 Almost every student who completes our program makes progress and sees significant improvement in the frequency of maladaptive behaviors as well as in daily living skills, socialization, speech and language, and other developmental skills necessary for greater independence. 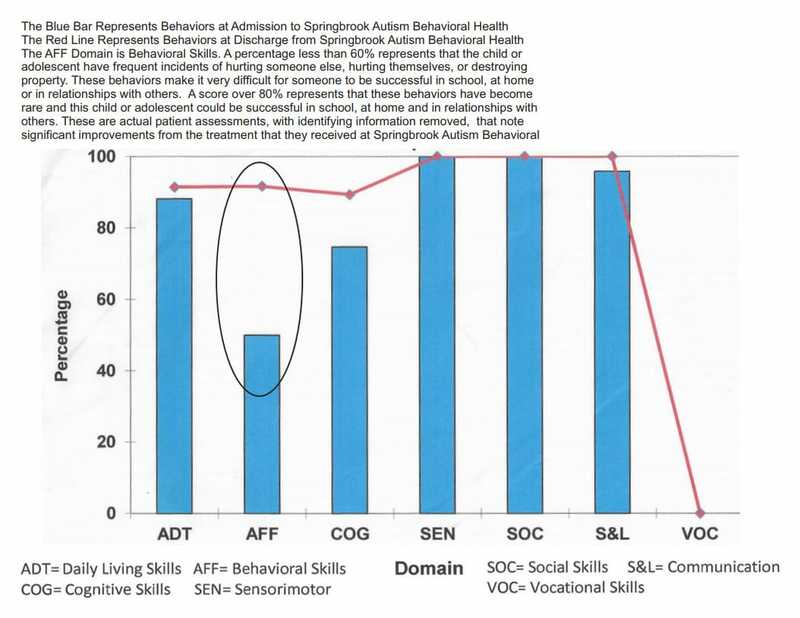 The average percentage improvements in follow-up assessments after 3 months of programming at Springbrook Autism Behavioral Health are noted below. These percentages reflect the number of new skills obtained from our 423-item functional assessment. *NOTE: Because of our intense focus on behavioral skills, most patients see dramatic gains in this area. 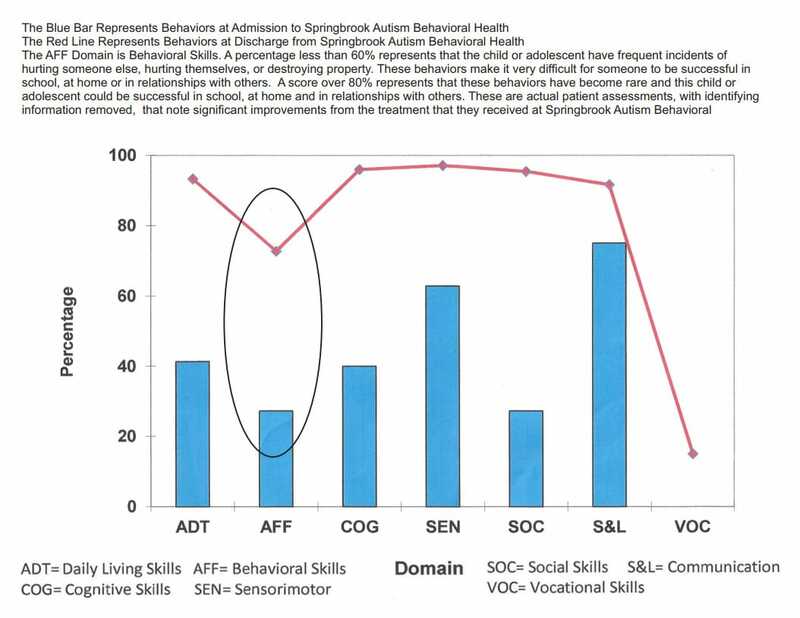 Our average percentage improvement in the Affective Skills domain is great enough to bring patients to a place where their behaviors are more acceptable at home and school. **NOTE: While we do address some Vocational (VOC) needs during the course of other treatments and therapies, they are not specifically programmed unless an individual patient has direct needs in that area. While the situations our students face can feel overwhelming, and while most of the students and families we work with have made unsuccessful previous treatment attempts, we are able to achieve remarkable results relatively quickly due to the unique, specialized structure of our program. At the core of our program’s structure is the belief that maladaptive behaviors can be deeply troubling to parents and other loved ones, but they make perfect sense to the child with ASD. In fact, these behaviors are often attempts that the child is making to communicate a deeper need or issue, such as anxiety or pain. For this reason, we provide a wide variety of treatments and therapies that address all areas of developmental need rather than merely addressing the behavior. Rather than defining the maladaptive behavior too narrowly, or focusing on behavior only, we assess all areas of development since we believe that all areas are related. You cannot treat a behavior without treating the environment, the mental and emotional health of the individual, and the physical triggers that precede the behavior. Using the developmental profile as a guideline, we tailor individual treatment plans for each student in our program. Throughout their time here, we monitor their progress closely and make adjustments that lead to their success. Our full developmental profile also enables us to group students with similar deficits and abilities into small units of 6 to 14 children, which means that they get 24/7 immersion and get to practice what they’re learning in individual therapy in their group sessions. We find that students are more likely to try and to improve when they’re in a group of peers who are facing similar challenges. The children in our program progress faster because they are getting the support and structure they need individually, in group sessions, and in the classroom. While many programs focus on intense individual therapy once a week, we design our program so that every moment is therapy, and every moment works to increase functional skills. Context matters. Programs should not treat ASD, or treat behaviors, in a vacuum but should use every means at their disposal to help children with autism succeed.